Great! Thank you. Very good seller. Quickly delivered. good product and quick delivery, as usual ! Works fine, this has the CP2102 chip on it. It also has header pins for +5, +3v3, GND TXD, RXD, and DTR, but all of the other pins of the chip are broken out on 0.1 unpopulated pads as well, so you get everything. So far no problems. It has a transmit / receive LED, and both 3.3 V and 5 V can be used for power supply, and cost performance is high. 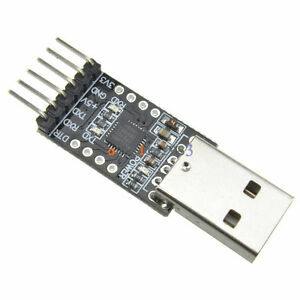 Works very well with Arduino boards like nano (I had a compatible one similar to nano). Just connected 5 wires to the nano, started Arduino, selected correct board and communication method and it uploaded corrtectly. Works perfectly in Windows 10, drivers are installed automatically. TX has 3.3V out so it works on both 3.3V and 5V systems. The goods are of excellent quality, I recommend! I sew them STM homemade oscilloscope.